Didyma, located in the southwest part of modern Turkey, was an important religious site of ancient Ionia. It was home to a large temple dedicated to Apollo, called theDidymaion. Pausanias (Greek traveler, ca. AD 160) explained that the Didymaion was constructed before Greek colonization (10th century BC), and many believe it actually dates to the 2nd millennium BC. However, the earliest level of the temple found thus far dates to the end of the 8th century BC, and the colonnade of the temple was erected a century later. During the Hellenistic period and years following, theDidymaion was one of the greatest Apollan oracular temples in existence, second only to the one in Delphi, Greece. There was a sort of “secret society” here at the temple, where people came to receive a divine oracle from Apollo at great material cost. The priestess would usually give only a few ambiguous words, most of which could have been interpreted in various ways. The inner room, called the Naiskos (shown in the lower right corner), housed the cult statue and the sacred spring used in the oracle. In Roman times the Didyma temple of Apollo was most notable for its 122 enormous columns; most today are in ruins, but two still stand. 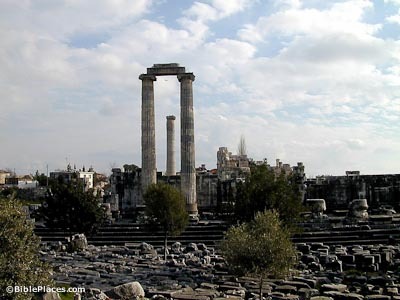 Christians in nearby Miletus certainly knew about theDidymaion and could see the differences in Paul’s ministry from pagan religious practices of the day. Whereas the priestess here gave oracles having no effect, Paul did not hesitate to publicly proclaim the Gospel, fully, freely, and requiring no payment (cf. Acts 20:20, 27, 33). “Didyma,” meaning “twin,” referred to Apollo and Artemis, a Greek god and goddess who were twins. 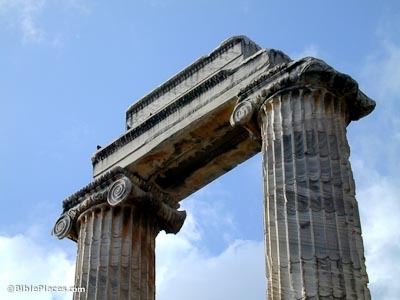 Artemis’ temple was in Miletus, while Apollo’s was here. The proximity of the temples is still apparent today, since there are remains of a “Sacred Way” connecting the two. 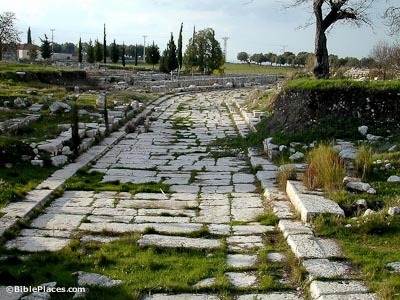 Flagstones visible on the road only date to the time of Emperor Trajan in AD 101, but he probably placed them directly atop an earlier road in the same location. 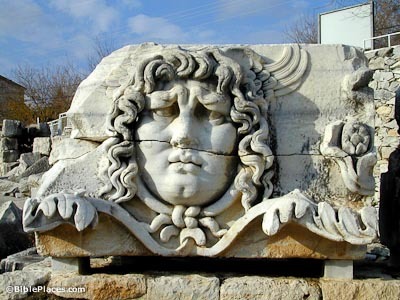 This giant Medusa head at Didyma was formerly part of a frieze on the architrave, possibly sculpted by Aphrodisias in the 2nd century AD. 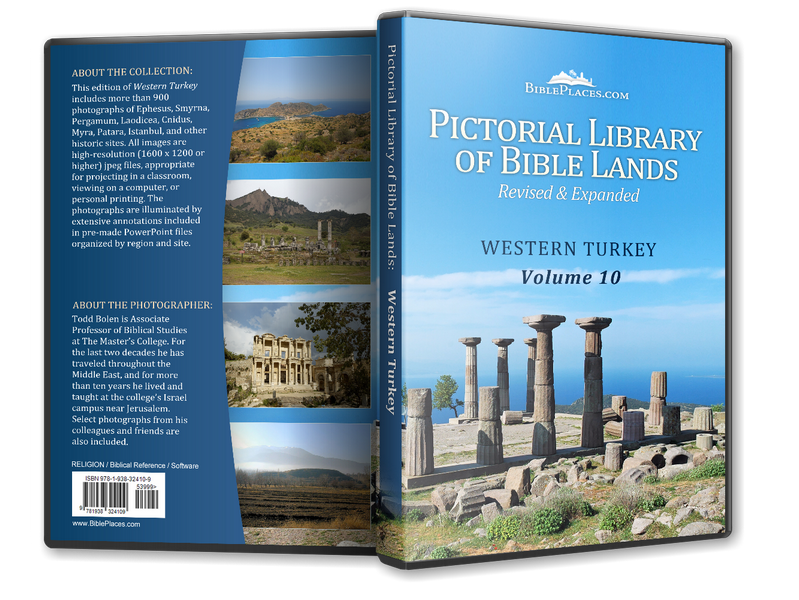 Download all of our Eastern Turkey photos! Didyma (Explore Turkey) Gives a brief history of the city, which focuses primarily on a description of the impressive temple at this site. A copy of this page is available atEphesus Guide. 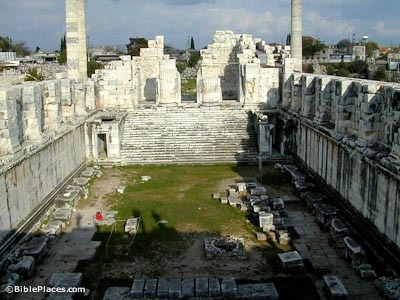 Didyma (Turizm.net) Offers a detailed description of the location, ancient structures, and history of archaeology at the site. Special attention is given to a description of the Sacred Way and the temple. The Oracle of Delphi and Ancient Oracles (Tim Spalding) Includes numerous annotated links and photos of the sites of ancient Greek and Roman oracles, including Didyma, Delphi and Dodona. Didyma (Perseus) Details the physical and historical description of the site. Contains a large number of resources for more extensive research, including links to art objects, atlases, reference articles, and pictures. Didyma (Kusadasi Guide) Briefly describes the temple and its ancient fame. Includes a section for tourists on how to get there. DIDYMA (Focus Online Magazine) This brief description offers links to related articles on the Temple of Apollon, the Sacred Way, and the cult associated with Didyma. Images of Didyma (ArtServe, Australian National University) Features many black and white photographs, focusing especially on architectural details of the temple. TURKEY / AYDIN >> DIDYMA (Volare Tour) Summarizes the history of the site and its attraction for tourists in a brief, well-written article. Didyma (Didim) (allaboutturkey.com) Scroll down to view the text. Focusing mainly on the history of the site, the succinct text offers internal links to related topics. Didyma (University of Chicago) This article, taken from the Encyclopaedia Romana, is part of a collection of essays pertaining to the end of paganism in Classical and Hellenistic Greece.